The BSE benchmark Sensex today surged by 467 points, the biggest gain in the past three weeks, taking cues from strong global trends, a day before the RBI's monetary policy review which is widely expected to hold rates. Brokers also attributed the rally to slight improvement in HSBC Indian Manufacturing Purchasing Managers' Index (PMI), a measure of factory production, in May. Birla Sun Life Mutual Fund has crossed the mark of Rs 1 lakh crore of assets under management (AUM). 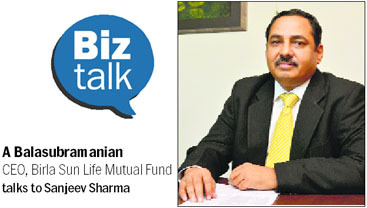 A Balasubramanian, CEO, Birla Sun Life Mutual Fund, says with the stock markets on an upward trend, retail investors should invest in equities for a long-term horizon. Defying market surveys on slowdown in the car industry, Honda Cars India Limited (HCIL) plans to produce 3 lakh units in India by 2017. This was disclosed by HCIL senior vice- president (marketing and sales) Jnaneswar Sen during a visit to the company’s manufacturing plant at Tapukara in Rajasthan. He also announced the scheduled launch of 7-seater MPV — Honda Mobilio — in July. Mukesh Ambani-owned Reliance Jio Infocomm Ltd (RJIL) has moved the Bombay High Court seeking approval for amalgamating its long distance services arm Infotel with itself. The telecom operator, which is looking to launch its services with a bang, has also approached the DoT for setting up an international internet services gateway required for connecting with overseas networks. "The bullish undertone in Indian equities has continued as markets have been rising in anticipation that the present government has the wherewithal to turn around the sagging economy," said Sanjeev Zarbade, vice- president, Private Client Group Research, Kotak Securities. Overlooking the GDP data released last Friday, the 30-share BSE barometer resumed the day strong and soared further to finish one week high of 24,684.85, a rise of 467.51 points or 1.93% from its previous close. 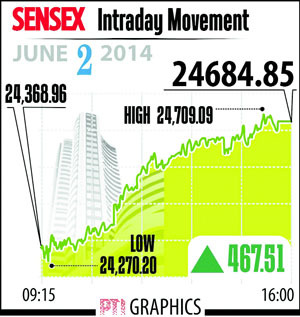 The 50-issue NSE Nifty flared up by 132.55 points or 1.83 per cent to end at 7,362.50. Construction and engineering giant L&T was the top Sensex gainer at 6.23% after the company announced better-than-expected Q4 results last week-end. Banking stocks notched up smart gains ahead of the RBI's monetary policy review tomorrow. Meanwhile, stocks of companies with interests in insurance sector rallied up to 10.5% today following a buzz that the Finance Ministry is contemplating raising FDI cap in the sector from 26% to 49% with some riders. Shares of Reliance Capital rallied 10.41%, while Max India rose by 10.05% on the BSE. Shares of Bajaj Finserv gained 3.15%, while Religare Enterprises was up 1.97%. The Finance Ministry is reportedly contemplating raising FDI cap in insurance sector from 26% to 49% with some riders such as restriction on voting right. Recently, insurance companies had met Finance Ministry officials. The insurance Bill has been pending in Parliament for a long time now. The FDI in the insurance sector is also directly linked with the pension sector as the cap will be the same. The new government would be keen to get the insurance and pension Bills passed in Parliament which can lead to higher FDI inflows. Q: How do you view the markets’ transition since last year’s volatility to date? A: Post September 2013, when RBI took a lot of measures to manage rupee-dollar volatility, we turned bullish on the market. This view was only strengthened when things were settling down on the currency and CAD improvement. The election outcome has added towards the improvement in the outlook for India. Post the formation of the new government, one of the things clearly emerging for the next 4-5 years, is India being viewed as an economy set on the upward graph for growth and managing inflation. We see it as getting into a pro-growth scenario which may also be supported by good corporate earnings. This being the case, India as a country should continue to see good flows from overseas. Q: What would you suggest for the retail investor in the present scenario? A: Retail investors need to step up exposure in equity, clearly keeping in mind that this money is for the long term. Money has the same value for everyone. Global investors are showing confidence in India and investing billions of dollars in India. There is a lot more reason for us Indian investors to be part of India's growth story. After all, these are the same people who have come together and elected the new government. This buoyancy of sentiment needs to actually start reflecting as confidence and higher participation in equity as an asset class for the longer term. The economy is on a rising growth path where the prospect of the nation will be the key focus for the new government. Therefore, my recommendation to retail investors is: (1) Those who already have exposure to equity, should increase their exposure, and (2) Those who don’t have, should start putting money in equity clearly keeping in mind that the money should be kept for 5-10 years. Q: What are the regulatory issues pending for the industry? A: Mostly everything is done, except that some measures towards attracting long-term money in the form of pension plan under the mutual fund umbrella could potentially be considered in the coming few months. Q: What are the current trends on SIPs? Investors are currently withdrawing/ stopping their SIPs. What do you think is the reason? A: What you are saying is right. However, there is an equal amount of new SIPs being registered simultaneously. Every month the number of retail investors registering new SIPs is equally on the rise. Most investors invest in SIPs for a period of 1-3 years. Very few investors put their money into perpetual SIPs, which should be the ideal strategy to ensure sustained returns over a period of time. Our advice to retail investors is to invest in perpetual SIPs and strategically stop it during important life events like buying a new house or retirement. In fact, at Birla Sun Life AMC, registrations of new SIPs have been on the rise over the past 1 year. Q: Are there too many requirements from investors on the KYC front? A: KYC norms have become much easier now to attract more retail participation. I think one of the things which could potentially come is keeping some of the bank accounts as KYC proof and that could potentially remove the various layers of work which is being done. Q: How is business at Birla Sun Life AMC? A: Our overall assets under management have crossed Rs 1 lakh crore and our equity portfolio has now grown to Rs 15,000 crore (domestic) and offshore it has grown to Rs 18,000 crore. Last year, we added around 1.28 lakh new investors through our investor education initiatives. We are also looking at building our offshore business in Dubai and Singapore. We will increase our dealer network by 35% this year by reaching out to more tier 2 & tier 3 markets and that will be instrumental for our growth. “We plan to produce about 60 lakh cars worldwide and 3 lakh in India by 2017,” Sen said. The company also posted its highest ever annual sales of 1,34,339 units during FY14, recording an 83% growth over previous year. “We will increase our dealer network by 35% this year by reaching out to more tier 2 & tier 3 markets which will be instrumental for our growth. At present, the company has 172 dealerships in 109 cities and this will be increased to 230 in 150 cities,” Sen said. HCIL started the production of cars from its Tapukara Plant in February 2014. Honda Amaze is the first car to roll out from the new plant and 86,000 units have been sold to date, Sen added. Sen said Honda Mobilio will be launched in both petrol and diesel variants in July. It was unveiled during the 12th Auto Expo in February 2014. Reports also suggested that RJIL could offer free content from the bouquet of television channels to those who sign up for its data services. RJIL may offer free content from the bouquet of television channels under the Network18 group to those who sign up for its data services. Reliance Jio is expected to launch telecom services by November and is in the process of tying up infrastructure arrangements.